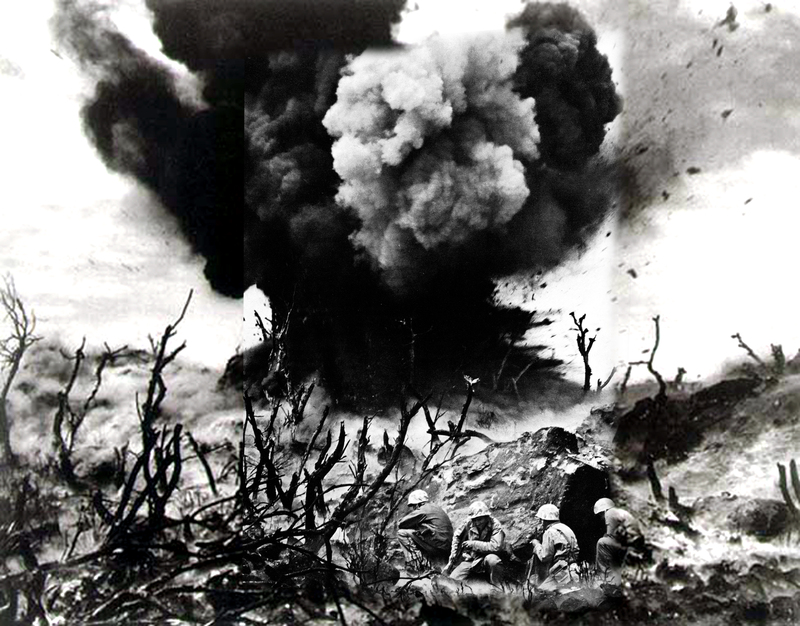 Marines of 23rd Regiment, 5th Marine Division, take cover from exploding satchel charge thrown into Japanese bunker. The stoutest defenses in the north of Iwo Jima were Hill 382 (which the Japanese called Nidan Iwa), the Amphitheater, Turkey Knob, and the smashed village of Minami. These several closely related positions become known collectively as the "Meat Grinder". Nidan Iwa, 382 feet high, was located 250 yards northeast of the east-west runway of Motoyama airfield #2. The top of the hill, surmounted by the stark remains of a Japanese radar station, was hollowed out and rebuilt to contain field pieces and antitank weapons. Each of these concrete gun housings was in turn protected by as many as ten supporting machine-gun emplacements. The rest of the hill was honeycombed with the same elaborate tunneling that characterized other major installations on the island. In addition, crevices and ridges crisscrossed the entire surrounding area. Light and medium tanks, armed with 57mm and 47mm guns, parked well back in these crevices, commanded the length of the main runway of the airfield and approaches from the southwest. These guns could defeat the armor of the M4 Sherman tank. After a two-day attack starting on February 28, 1945, Company E of the 23rd Marines broke through and captured Hill 382. The 23rd Marines suffered 50 percent casualties since D-Day.